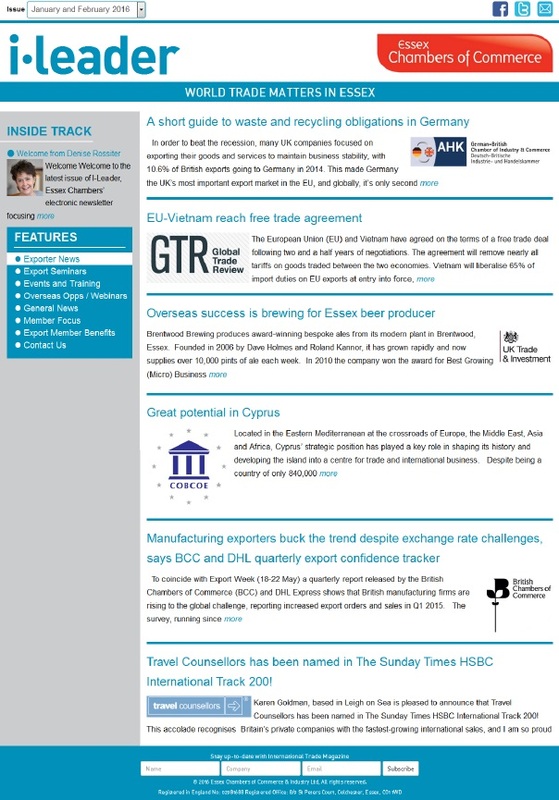 This quarterly publication features International Trade news from around the world and includes your exporting news and activities, events and training, in both UK and overseas markets, and Exporting FAQ’s. Content should be relevant to International Trade/Exporting, and be non-sales heavy and approximately 500-1000 words. Content must be in Word document format and please include your logo and/or a small jpeg or png photograph/image. See below on how to submit your news story for consideration. You will receive an email informing you if your article will be included. We cannot guarantee that your submission will be included in the next issue and Essex Chambers of Commerce reserve the right to adapt your article and choose a suitable image, if the maximum word count of your article is exceeded or you do not forward an accompanying image/logo.